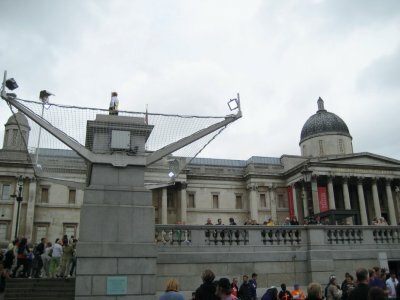 Antony Gormley's Fourth Plinth art project in London's Trafalgar Square. 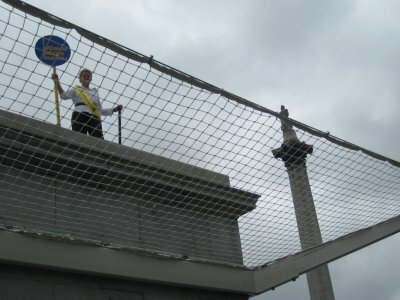 The One and Other project will see a different person standing on the plinth every hour for 24 hours a day for 100 days from 5 July to 14 October. 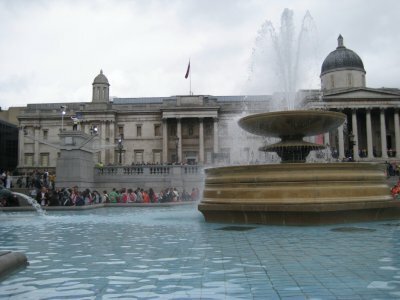 Antony Gormley's Fourth Plinth art project is now running in London's Trafalgar Square. 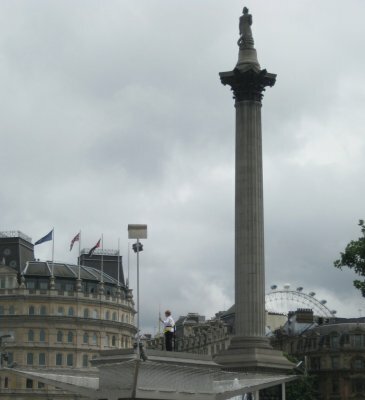 The One and Other project will see a different person standing on the plinth every hour for 24 hours a day for 100 days from 5 July to 14 October. 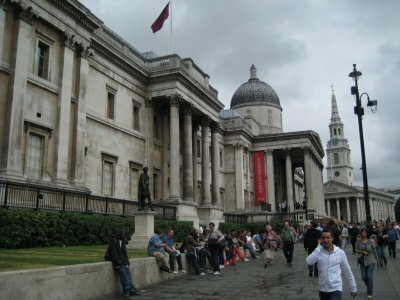 FYI, a plinth is the base or platform upon which a column, pedestal, statue, monument or structure rests. 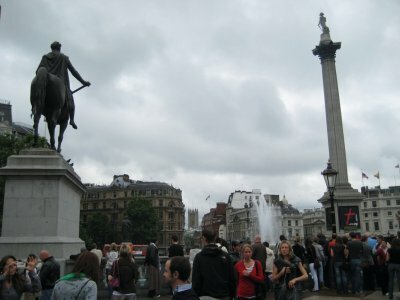 In Trafalgar Square there are four plinths on the corner of the square, though only three of them hold statues. 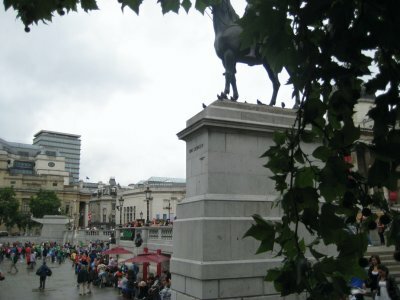 The empty fourth plinth was meant to hold a statue of William IV, but due to lack of cash that statue was never built. Nowadays it usually holds modern art. 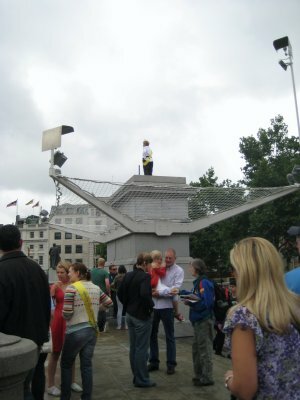 The most recent project is Antony Gormely's project, which sees regular people standing up there for an hour each. Some are doing actual arty stuff, while some are just up there for the heck of it. 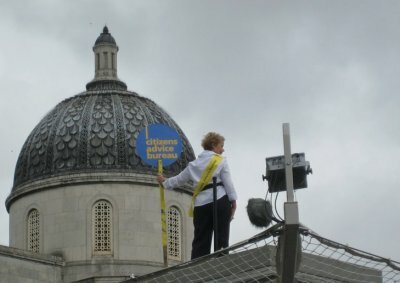 I went down today and saw a woman standing on the plinth holding up a sign for the Citizen's Advise Bureau, an organisation that helps people with free advise on their rights. People have to stand up there rain or shine, even in the middle of the night. That's pretty cool. 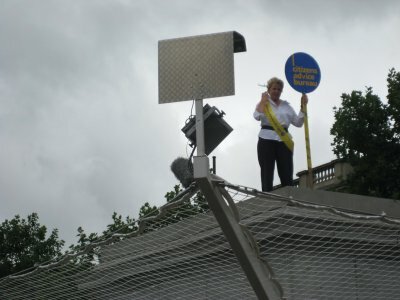 I wonder how hard it would be to get yourself up there? Certainly some bragging rights.